According to the tenets of Buddhism there are four main stages or four main paths in the spiritual progress of a monk, who has chosen the Buddha as his master and decided to follow the Eightfold path suggested by him. Having taken refuge in the Buddha, the Sangha and the Dhamma, a Buddhist initiate has to graduate himself from one path to another before he attains Nirvana or the final liberation. 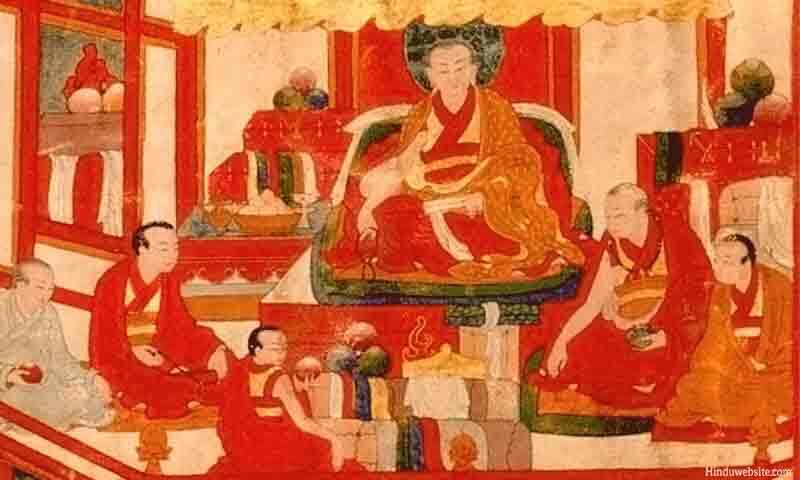 This happens when the monk achieves inner inner purification, by overcoming the ten great evils, which are: delusion of soul, doubt about the Buddha or his teachings, adherence to rituals, sensual desires, aversion, desire for material things, desire for spiritual things, pride, self-righteousness, and ignorance. The success in each stage or on each each path depends upon the initiates previous lives and actions. A person may achieve success on all the paths in one life time or spend several life times even to cross one path. A monk who has already followed the footsteps of the Buddha in his previous lives and accumulated good merit has a better chance of completing the final path than the one who has never been a follower of the Buddha in his or her previous lives. The Four Paths or four stages are easily recognizable as they have their own distinct characteristics that distinguish them from one another. We will now describe these four paths in some detail. The First path begins when a person because of his or previous good deeds, good thoughts, practice of virtues, discipline, and some latent familiarity with the dharma, has come to know about the teachings of the Buddha and decided to pursue the eightfold path suggested by him. At this this stage the aspirant succeeds in recognizing the Four Noble Truths and the eightfold path, through contemplation and quieting of the mind, having taken refuge in the Buddha, Dhamma and Sangha. During this stage many doubts and fears the initiate had before start weakening or disappearing and the resolve to continue on the path become stronger. The first path leads to freedom from delusion, from doubt regarding the life and teachings of the Buddha and from belief in the efficacy of the rituals and ceremonies. In the Second stage the monk is already freed from doubt and delusions of self and from the practice of rites and rituals, having established strong control on the movements of raga (attachment), dvesha (aversion) and moha (passion) in his consciousness. The monk's knowledge and commitment to the four noble truths and the eightfold path are firm and unquestionable. He or she is now eligible for the next stage having made necessary effort and attained the required virtues and perfections. The monk is now left to take only one more birth, if at all required due to physical limitations, to complete the remaining stages and attain final liberation. In the Third stage the monk has cut asunder the chain of births and deaths. He has exhausted all his karma and will never return to the earth again unless he has consciously decided to help the humanity as a bodhisattva. The time for his Nirvana has arrived and it can happen any time. In this stage whatever remnants of attachment and aversion that remained with him so far would also disappear gradually. The Fourth Path or stage is the state of an Arhat. It is the highest state to which a human being can aspire. An Arhat is an adept, who has been completely freed from all attachment, and desire for rebirth, both in the worlds of form (rupa lokas ) and formless worlds (arupa lokas). No trace of pride, self-righteousness and ignorance exist in his consciousness. The only feeling that is left in him is a constant and boundless wave of good will for all the beings. He remains in this state of mind when asleep or awake, when sitting or standing, walking or lying down. He has become holy. Anasatti Sutta from Majjima Nikaya1 refers to four types of noble disciples in the following manner.